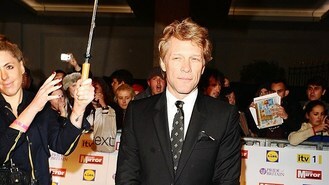 Jon Bon Jovi has put his European promotional tour on hold, as he jetted back to the US in the wake of Hurricane Sandy. The Bon Jovi frontman had been in London to promote the band's upcoming 2013 tour but decided to fly back to his American home to comfort his wife Dorothea and their four children. "I really need to get back home having spoken to my wife and kids who are stuck in New York. I need to be with my people. Thankfully my family are safe," he told the Daily Mail. The 50-year-old, who was born Francis Bongiovi Jr, insisted he would return to his hometown of Perth Amboy in New Jersey. "There is no power, water, the devastation is off the charts. The President is in my home town in New Jersey because of the damage," he said. "It's like Armageddon. Where my children surf, 80 houses burnt down. I need to find a generator and get that working." Bon Jovi added: "What can I do, I have to get there and find out. We take care of each other, that's what we do in own town." Nickelback's Chad Kroeger has confessed he has had to tame his wandering eye since becoming engaged to Avril Lavigne. Britney Spears has the strongest group on The X Factor USA, according to felllow judge Simon Cowell. One Direction's Harry Styles has revealed that he gets embarrassed by his teeny-bopper X Factor outfits. Elisha Cuthbert stars as a girl looking for a happy ending in Gaslight Anthem's new music video. Madonna has tried to make amends with Lady Gaga, after publicly praising her voice. Amy Winehouse's wedding dress, which was to be auctioned for charity, has been stolen from her home. Ne-Yo has insisted he will only choose film roles that take him outside his comfort zone. Richard Hawley is among the favourites to win the Mercury Prize six years after he was "robbed" of the award. Britney Spears was coolly professional on the first live episode of The X Factor - but the same cannot be said for new host Khloe Kardashian Odom and her microphone.